Wingfoot Lake's rich heritage dates back to the early twentieth century when it was created to supply water for the Goodyear Tire & Rubber Company's busy manufacturing facility in nearby Akron. The 540-acre lake served as a recreational haven for generations of Goodyear employees, who would come with family and friends to fish, boat, or simply relax by the water. 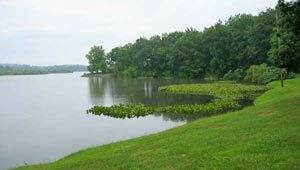 In 2009, TPL and Goodyear partnered with the Ohio Department of Natural Resources Division of Wildlife to create a new state park at the former Wingfoot Lake recreational facility. In the summer of 2011, lawmakers approved the purchase of a final 20 acres from TPL. Now the public will enjoy lake's scenic beauty along with its playgrounds, picnic pavilions, tennis and basketball courts, ballfields, and a small boat launch. An additional 600 acres will be protected as a state wildlife area.